This is Prentice. Well, most of it. Tomorrow I’m going to seam these pieces together, attach the D-rings, and pick up and knit the top and the bottom of the tube. And do the i-cord drawstring. I’m debating whether I want to knit the strap today while watching college football (down with Ohio State!) 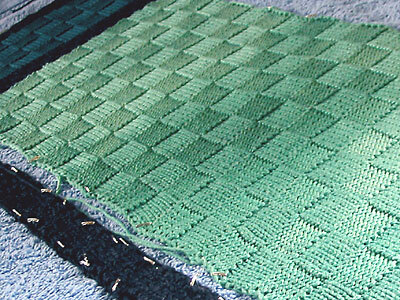 or set it aside and work on something that’s more interesting than a mile of basketweave. I might opt to set it aside, since I can’t finish assembling the strap anyways without a trip to Big Box Craft Store. CogKnition posted this on September 30th, 2006 @ 3:30pm in Unfinished Objects | Permalink to "Some Assembly Required"
Basketweave may be boring, but it looks so cool! Your knitting looks so even and perfect!